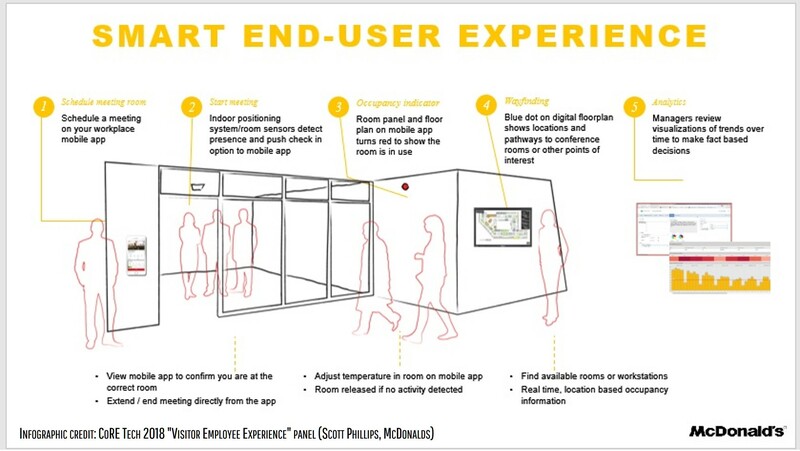 The Enhanced Occupant Experience � Taking Buildings to the Next Level! Companies today are under constant pressure to create competitive advantage in their respective markets, and that competitiveness extends to their unique company brand and culture. 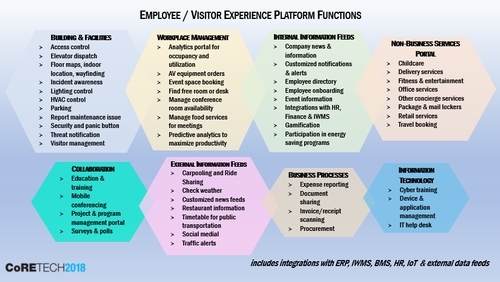 Efforts to create the 'ideal workplace' have given rise to the experiential phenomenon for visitors and employees. In the same way that consumers now expect technology to offer a seamless, enhanced shopping or entertainment experience, employees seek out companies that can offer a digital workplace that responds to their needs and perhaps even anticipates them while promoting productive work activities. There are now a host of technologies that we can use to manage, monitor, analyze and improve on experience initiatives. This is a relatively new concept, which began with the idea of allowing building occupants to take more control of their building by making micro-adjustments to room temperature using an app on their mobile phones. 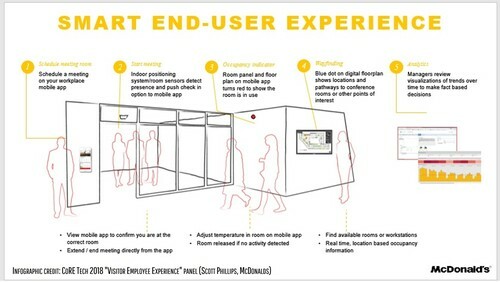 The other big driver was mobile user management of meeting/conference room bookings. As these early mobile applications became more common, they effectively put more power in the hands of the occupant, such as digitally reporting maintenance issues from their mobile phone and other similar tasks. From that beginning, it was a short leap to the creativity we see now around developing applications; suites of services and functions that enhance that occupant experience in unanticipated ways. From a technology standpoint, a lot of the experience phenomenon crosses the lines between design (both architectural and interior design) and the technologies to support experience (UX/UI, integration strategy, etc.). This is because there's just no way you're going to have a good experience in a traditional cubicle office, no matter what you put there; it is the same with outdated analog business processes. Organizational initiatives in Experience Design and Design Thinking are helping companies understand the nuance of the experiences they are trying to create and to really understand, at a very granular level, peoples' needs and desires. 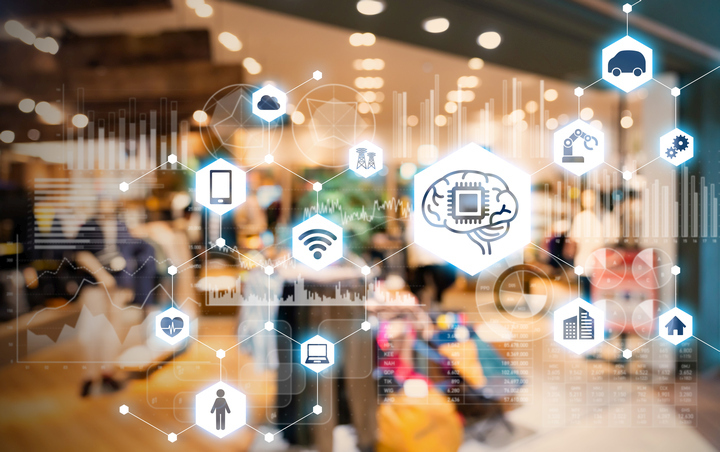 The big data analytics from the sensors and other technologies to monitor occupants' behavior have increased our knowledge in a measurable way about user preferences and behavior patterns. Some of the major elements of experience still draw on timeless architectural efforts to design a space that is welcoming to human sensibilities: the orientation of the building, the use of natural light and landscape to bring nature in and comfortable furniture that is not only functional but conducive to collaboration and creativity. The technology basics are of course a must, such as very reliable WiFi and cellular for uninterrupted service. Additionally, privacy spaces and designated quiet areas are important. 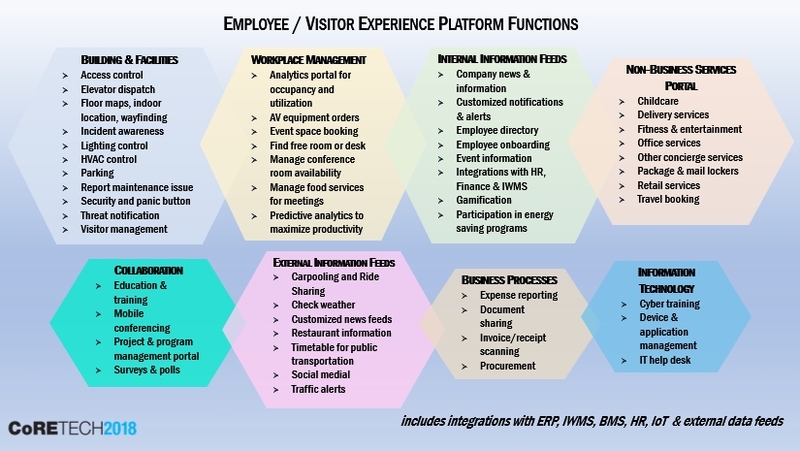 New technology continues to improve on these ideas by making the visitor and employee experience immersive, intuitive and interactive. 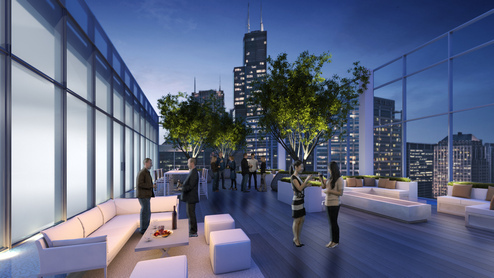 For example, the 151 Franklin building in Chicago has a mobile app that offers an interesting amenity. From a pre-set geofence, the tenant platform recognizes you when you're within 400 yards of the building. It then tees up the building application without the need to unlock the phone or log in, and as you enter, you simply swipe your phone at the turnstile to get immediate access and requisition the destination dispatch elevator. In the near future, the app will start conditioning your office area. It creates a feeling that the building is aware, welcoming and anticipating your presence. At the eBay Main Street corporate headquarters, digital visual media start incrementally as you enter the building, with columns that light up with information, to interactive touchscreens and on to a huge custom display in the largest auditorium. "We are reinventing our brand, we are reinventing our culture, and it's so important to have a physical manifestation of that. It's how we show up to our community," said Lars Kongshem, Director of the Corporate Digital Experience at eBay. Many other large corporate players are leading the way in providing the best work environments available today. They include LinkedIn, Salesforce, ExxonMobil, Google, Aruba, Facebook, Microsoft, CBRE Workplace360, McDonald�s and others. 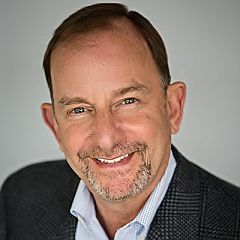 The fundamentals on digital transformation and evolution, including workplace experience, and other industry top of mind topics, will be discussed at Realcomm | IBcon 2019. The conferences will be held in Nashville, TN on June 13 & 14. (Pre-Con, Golf and Tech Tours June 11-12). Register early and save!